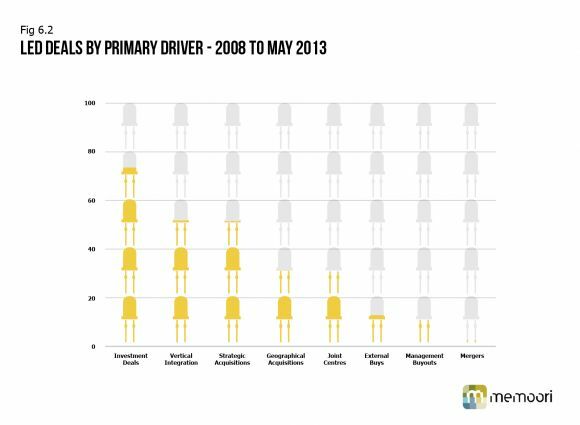 M&A drivers in the LED industry vary widely, according to Jim McHale of Memoori. Over the course of the last five years, Memoori has been closely monitoring developments in the LED market, tracking a total of 238 significant deals. Although we cannot claim that this list of deals is exhaustive, it certainly paints a picture of the mood in the market and the strategies of its respective major players. The total value of deals where disclosure was made during this period was nearly $8 billion, peaking in 2008 at over $4 billion. The number of deals completed over the five-year period remained fairly consistent. The median value of deals also fell slightly over the period of analysis, ranging between a maximum of $18.3 million in 2008, to a minimum of $11 million for 2013 data to May. A decline in the average spend on acquisitions is not surprising given the impact of the sovereign debt crisis in Europe and its impacts on financial markets, liquidity and market growth. 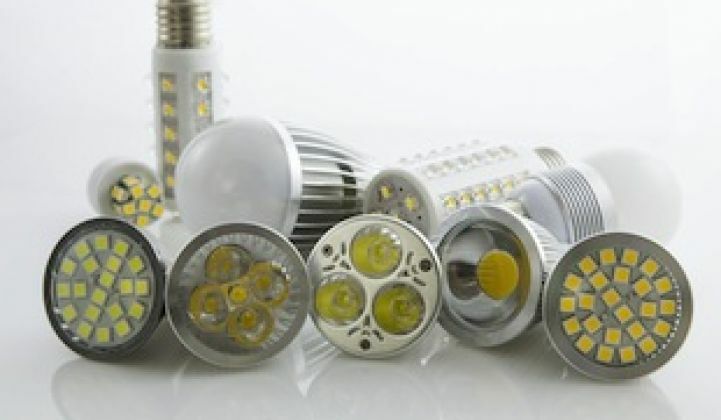 The industry has already undergone major consolidation and restructuring from 2006 to 2011 and is now catching its breath to monitor the progress of LED adoption in major markets. Many significant strategic, geographic and vertical integration moves, particularly by the likes of Osram and Philips, had already occurred prior to 2011. There is an element of unease in the market at the risks of oversupply given that adoption rates have not been as rapid as many predicted. Our analysis shows that in the LED lighting market, M&A drivers vary widely depending on the strategy of the investing parties. We categorized the main drivers for deals into eight distinct areas. The graph below from our report, The Business of LED Lighting in Buildings 2013 to 2017, shows the number of deals completed in each category. External Buys: Investment in LED lighting by organizations which were not previously delivering LED lighting. These companies tend to be in industries closely related to the lighting market, such as electronics, chemicals and solvents (relevant to the phosphors portion of the market) and IT service delivery. Examples of this kind of investment included ARB Holdings' (a South African based distributor of cable, overhead line transmission and electrical products) acquisition of a 60 percent stake in Eurolux, an importer and distributor of energy-saving LED and fluorescent lamps. Geographical Acquisitions: Geographical investments have proven to be a significant driver of M&A activity. M&A, rather than organic growth, have proved to be the main market entry strategy by overseas acquirers. They have primarily been driven by companies in the center of the value chain seeking access to new markets and distribution channels. Example acquisitions include Cooper Industries’ acquisition of U.K.-based Apex Lighting. Vertical Integration: A consistent trend in the LED lighting space has been that of vertical integration through investments and acquisitions. Such deals have often been motivated by the need to access new technologies, or to close knowledge gaps in respective organizations’ LED supply chains. Notable deals of this nature include Cree’s acquisition of Rudd Lighting to move further downstream in the value chain. Strategic Acquisitions: The LED lighting market in many countries remains highly fragmented. We have already seen a slew of strategic acquisitions in the LED space and we predict further deals of this nature in the years to come. Such deals have been motivated mainly by economies of scale, desire for improved market share, and access to a wider customer base, but also by the desire to realize cost savings and pushing product sales of a wider range of LED-related goods through a larger global sales force. As noted, Philips and Osram in particular have aggressively pursued acquisitions of this nature to drive their LED lighting growth strategies. Notable deals of this nature include Philip’s acquisition of Genlyte Group. Joint Ventures: There has been a growing trend in the LED market for Joint Ventures, with the number of JVs rising from only one in 2008, to six, four, and eight in 2010, 2011 and 2012, respectively. JVs have been largely oriented toward either gaining access to complementary technologies or gaining improved access to new geographic markets. The JV trend has been particularly popular amongst Asian-based players looking to access the mainland Chinese market. Investment Oriented Deals: Venture capital investments in LED lighting firms continue to buck the trend of the wider market. These deals either seek to improve the performance of the target company or are ventures gambling on the success of a particular technology’s ability to win out in the IP race that is helping to drive the LED market. Management Buyouts: There have been a total of seven management buyouts within LED-related firms during the period analyzed. Several of these management buyouts have been supported by a private equity funds. Management buyouts over the analyzed period include U.S.-based lamp and luminaire designers Hunter Lighting Group. Mergers: There have been surprisingly few merger deals in the LED lighting space during the period of assessment. The only deal of note was that between two Taiwanese firms, Lextar Electronics Corp and Wellypower Optronics Co. Ltd., which in October 2012 agreed to form an amalgamated company operating under the slightly changed name of "Lexstar." The firms cited the desire for improved competitiveness, economies of scale and expanded sales channels as the main motivators for the agreement. Cautious investor sentiments and the emerging effects of oversupply are likely to create downward pressures on M&A activity at the upstream end of the supply chain over the coming year. We see the trend of vertical integration, particularly downstream in the value chain, set to rise, with more building controls companies eyeing the market, and acquisitions of lighting controls companies by LED lamp and luminaire manufacturers likely to continue. To conclude, the medium- to long-term growth potential of the LED lighting market still carries considerable promise. Economic factors might suggest that total M&A activity will remain flat, but we believe the underlying trends highlighted here indicate that LED acquisitions will grow from 2012 figures. Jim McHale founded Memoori in 2008, a consultancy company based in London that provides market research, business intelligence and financial deal tracking services to clients across several industries. The Business of LED Lighting in Buildings 2013 to 2017 report highlights important conclusions, supported with facts, as to what is shaping the future of the LED lighting industry.